I should have made extras of these poached apples. I didn’t think of the million ways they could be used post-dessert. Now I want rice pudding. Drats. Good for you making your own rice pudding. I was lazy the store stuff isn’t that great. Looks fantastic. I think this would be terrific with rice pudding or yogurt, but we went the ice cream route, without regrets. I wish I’d made a double batch. I’d love to have some waiting in the fridge for me right now. Your apples look delicious. I had mine with yogurt too, but the rice pudding sounds amazing. Nice to have them both ways!! Great idea topping yogurt and rice pudding with the fruit. Sounds fantastic. Thanks for sharing. Love the fruit with the yogurt, but you had me at rice pudding- childhood and adulthood favorite. We are trying to stop doubting the Dorie. 🙂 And yes, its been great to eat these with leftover pork roast all week. What a great rice pudding you made. Wonderful post! Wasn’t this delicious. I used pears but am anxious to try apples. I noticed that you cut them into eights instead of half, easier done with apples than pears. You’re right, this is breakfast, lunch, dinner or snack. Just lots of different ways to go with this recipe. Yea, Dorie. Your rice pudding does indeed look good. 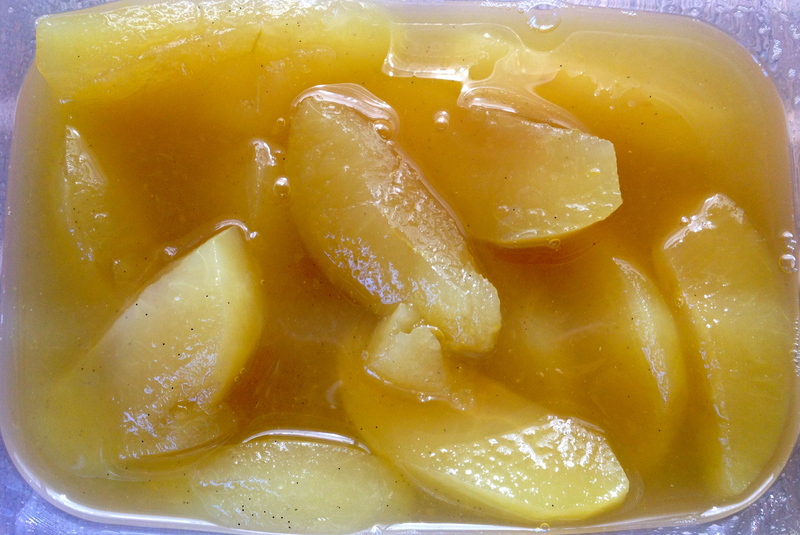 I have made all sorts of poached pears ever since I started cooking. I was a bit ho hum about this one too but made it anyway as I needed to kick it into Dorie gear again after a few weeks off. All this time and I’d NEVER had them for breakfast with yogurt but I’m hooked. I think this is going to become a weekly thing for me now. Never under estimate The Dorie. Delicious over rice pudding, which by the way is so easy! You made a dreamy fall combination. Have a good weekend! I tend to get distracted by many things at once…this trait boggles my husbands mind! However most times women are very good at multi tasking…I think it’s in our genes!! 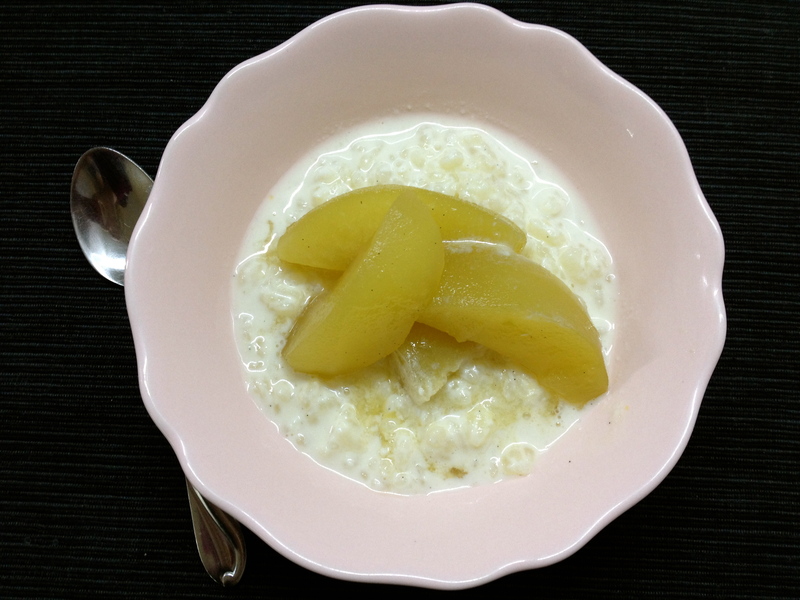 Your apples look wonderfully delicious served over the rice pudding! So glad this was a hit for you…we really enjoyed it too! Enjoy your weekend! go back to the other rice. Have a wonderful weekend. These apples look delicious! I love that you served it with rice pudding. How yummy is that? sounds like a lot of us ate rice pudding last week (me included). but my favorite is made with arborio rice, so creamy! 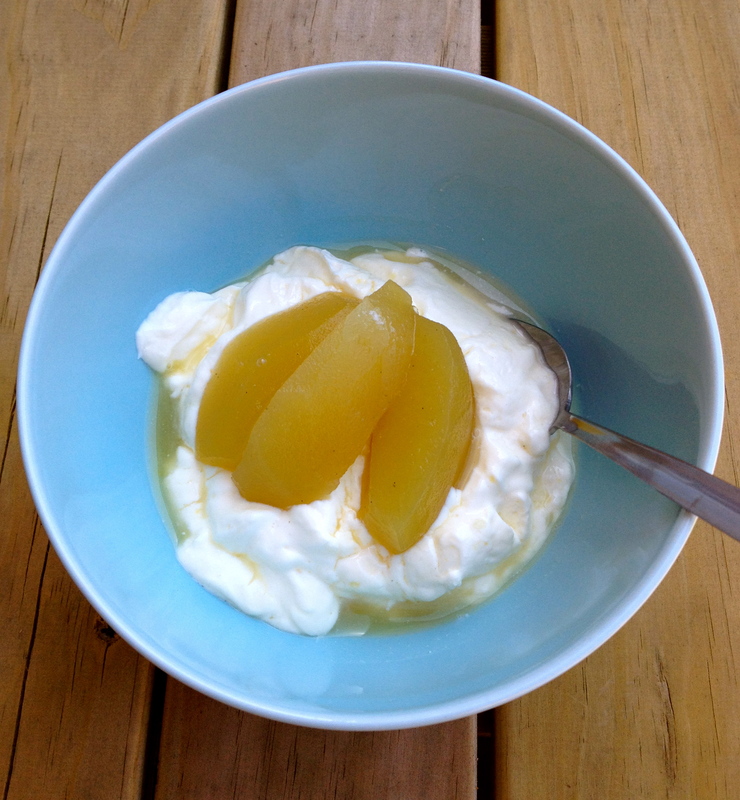 and poached fruit over yogurt for breakfast sounds like a tasty and healthy start to the day. lovely! I had such fun with this simple recipe but am jealous that you had all the ingredients on hand. But I did have a fun trip with Nana sourcing the spices. Great time of year for spice shopping. And now I have to try some homemade rice pudding !! Vanilla rice pudding ? Yes please !!!! Sounds lovely and glad your pears turned out so well. Nana and I each considered this a big success. Loved that aroma !!! I love rice pudding. Sounds lovely with the poached pears. I used apples which fell apart, so I ended up with applesauce, delicious though. I love that you call a cinnamon stick a quill. So much more glamorous sounding. I’ll have to make this again & try it with yogurt. Your apples look beautiful & whole (unlike mine) and I definitely support the rice pudding choice! wow. that sounds like the perfect fall recipe. I’m gathering so many great ideas for this recipe, which is currently on my catch up list. Hopefully I’ll get to it next month and I love the yogurt idea.